Necrosleezer where a band from Vancouver B.C, Canada that consisted of former Blasphemy members that played black metal with some elements of thrash and grindcore and all of the songs where recorded in 1995 and the ep is called "Pope Kill" and will get a proper release in November by Nuclear War Now! Productions. Distorted guitar noises start off the ep along with a small amount of leads before going into more of a heavier direction while the vocals are mostly grim black metal screams as well as the faster sections of the songs also bringing in a great amount of blast beats and war metal elements. Throughout the recording you can also hear a great mixture of slow, mid paced and fast parts while the tremolo picking also gives the songs more of a raw feeling along with all of the musical instruments having a very powerful sound to them and the music also incorporates elements of death, thrash metal and grindcore. 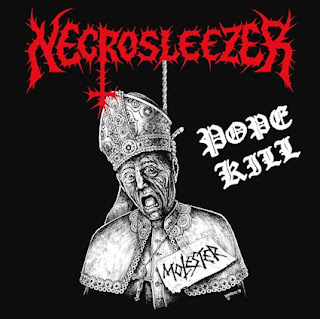 Necrosleezer played a musical style that was mostly rooted in war, black and death metal while elements of thrash and grindcore where also added into the music, the production sounds very dark and raw while the lyrics cover blasphemous themes. In my opinion Necrosleezer where a very great sounding mixture of black and war metal with some elements of thrash and grindcore and if you are a fan of those musical genres, you should check out this band. RECOMMENDED TRACKS INCLUDE "Pope Kill" and "Mistress Rotten Church". 8 out of 10.